If you’d like new double hung windows installed on your home, whether your old windows are broken or you need an upgrade in terms of energy efficiency and aesthetic appearance, turn to L.J. Stone Company, Inc. We are the window installation company that residents of Indianapolis and other cities in Indiana have depended on since 1967, which means we have decades of experience in providing top-rate services and high-quality products. In fact, our commitment to achieving total customer satisfaction on every project has helped us earn and consistently maintain an A+ rating with the Better Business Bureau. Our windows are also backed by one of the most comprehensive warranties in the industry – a lifetime limited manufacturer’s warranty that covers all window components, even if the glass is accidentally broken. And, since registration isn’t required, you’ll have instant assurance that your purchase is protected. 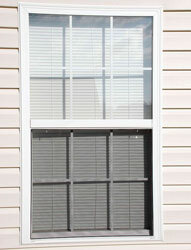 For more information about having our team install our double hung windows on your home in Indianapolis, IN, contact L.J. Stone today.